LIFE is better in PINK: Mommy Mondays - It Doesn't Have to be a Meal! Happy Monday blog readers! Last Monday, I introduced my first Mommy Monday Post! I will be posting something mommy related every single Monday! The first 4 weeks of Mommy Mondays will be focusing on healthy eating. Getting my girls to eat healthy foods is a main focus in my house! Every mom has that "thing" or "things" that they are super passionate about and this is one of my "things." Last week was all about getting in a vegetable at breakfast, before your kiddos are even awake enough to realize what is happening! You can read about that (plus find a really great recipe) here! 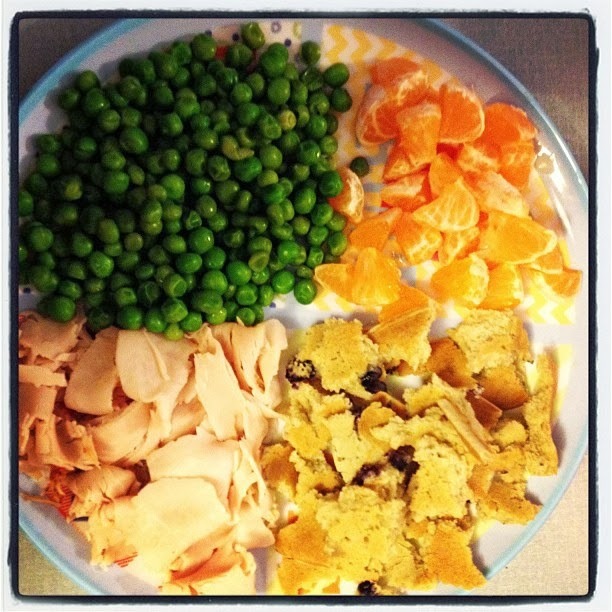 Mommy Mondays Healthy Kids Tip #2 - It doesn't have to be a meal! Sometimes getting children to eat (and eat healthily) is a huge challenge. It can be even harder if you are focusing on cooking a "meal" that your child will like and eat. As adults, we tend to have a mindset that certain foods belong together and put those foods together to make a "meal." We combine foods that we believe taste good together: fish and chips, spaghetti and meatballs, steak and potatoes, eggs and bacon, etc. Children have no concept of "meals" or foods that go well together! Just like in last week's post when I stated that kids don't think of vegetables as only a dinner and lunch food, kids also don't think of putting together a meal with specific foods that complement one another. 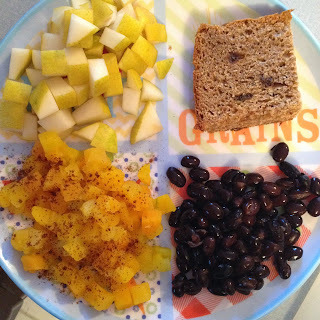 Even though I do create "meals" for my girls to eat, I am also just as likely to put 4 healthy items on a plate and present it as breakfast, lunch, or dinner! And guess what?!? This method of making a non-meal is so much easier and requires minimal planning! It is also a great way to use what you have in the fridge/freezer/pantry! 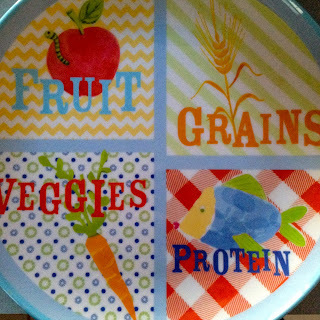 Here's what you are going to do - buy a cute sectioned plate and fill it up with a fruit, a vegetable, a protein, and a whole grain! I see plates like this everywhere! I found this specific one at Pottery Barn Kids but I have seen them anywhere from the grocery store to Target! They are cute and give you an awesome starting point for creating a non-meal! This was so easy! She ate every bite and just loved her non-meal dinner. She doesn't know that this wasn't a "meal" or that these foods don't necessarily go together. She just knew that it was all things she likes to eat. And I knew that it was healthy! See this plate does not seem like a meal (it is certainly not something that your average adult would eat for dinner), but it still provides plenty of healthy nutrition for my busy two year old!